Women’s soccer faced the hardest stretch of schedule of this year’s campaign. In a fall foliage tour, the women traveled to No. 3 Williams and No. 5 Middlebury looking to clinch a spot in this year’s NESCAC tournament, for which the top eight teams qualify. The Cardinals did not show any fear about the Ephs’ national ranking on their arrival to Williamstown. Under rainy conditions, the Birds kicked off with high pressure on Williams’ defense. After a near goal by the Ephs in the fourth minute, the Cardinals grabbed an early lead just five minutes later. Perennial goal-scoring forward/midfielder Liz Young ’19, who has 17 career goals in a Cardinal uniform, added to her tally with an excellent finish on a breakaway. Williams’ goalkeeper Olivia Barnhill made a decent effort at a save, but Young made no mistake and tucked the shot in the bottom corner of the net. Williams’ shock at being scored on so early was clear, as the side has only allowed .37 goals a game and is undefeated on the season. However, the Ephs turned the tide with a cluster of shots throughout the first half, tallying 15 total to only four by the Cardinals. One of these shots found the back the back of the net in the 43rd minute, after a shot by Sydney Jones was deflected back in front of the net on a save by Cardinal goalkeeper Sarah Hammond ’22. Rain Condie managed to get to the ball first and equalized the score at 1-1. At the half, the Cardinals looked to improve on the pressure they faced from the Williams offense, who tallied 15 shots and 2 corners. The tie was broken inside four minutes, when Georgia Lord chipped Hammond in net to give the Ephs a 2-1 lead. At various points in the second half, it looked as though another few goals might trickle in, but both defenses and goalkeepers held strong. The Ephs put 23 total shots at the Cardinals, forcing Hammond to make a season high seven saves. It was a big start for the first-year goalkeeper, who earned the nod over regular starter Zoe Cassels-Brown ’20. The win lifted the Ephs to 6-0-1 in conference play and dropped Wesleyan to 3-2-2. After the close loss against Williams, the Cardinals traveled to No. 5 Middlebury to continue their road trip. Unfortunately, this one looked like a losing effort from kickoff. The Panthers scored early and often, tallying two goals on nine shots in the first half. The Cardinals applied some pressure with six shots and a corner kick but went into the half down 2-0. The onslaught continued in the second half, as Middlebury added three goals on 14 shots, all unassisted. The Red and Black had a handful of chances but were unable to capitalize on any. One bright spot was Cassels-Brown’s performance in net. She tallied eight saves to move her season total to 34. 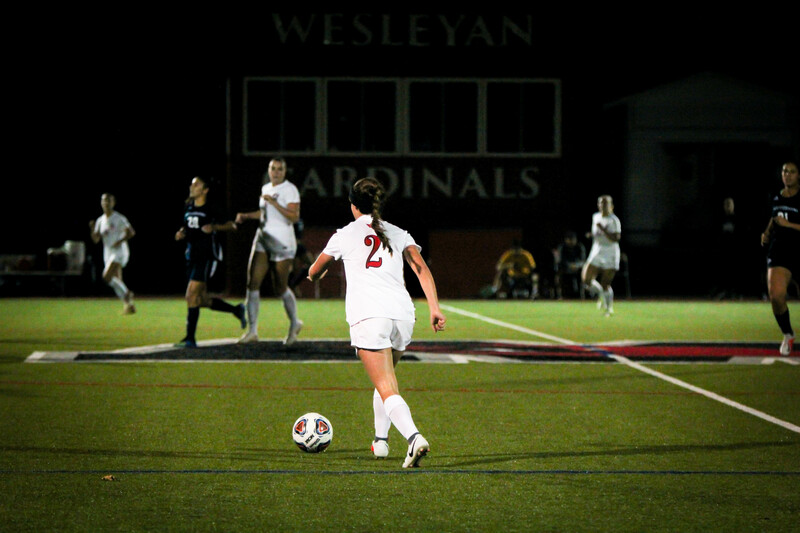 The loss moved the Cardinals to 6-4-2 overall and an even 3-3-2 in conference. Despite the loss, the Cardinals are assured a spot in the NESCAC tournament, even if they drop their last two conference games. Despite getting swept in weekend play, the overall trend of the season has been a positive one for the Cardinals. After an unsuccessful season last year, the women’s team is in good shape to qualify for the NESCAC tournament. One choice that is certainly paying off for the Cardinals is moving Argento to forward. The duo of Argento and Young has netted 10 out of 20 Cardinal goals this year, with seven of those coming in crucial conference matchups. “I feel like my own personal role has changed a lot because I changed positions from center defense to forward, so my role is now to score goals, which is critical for us to win,” Argento said. If the Cardinals can continue to score and hang with nationally-ranked teams, they will be a low seed to watch in the NESCAC tournament. Next up at home, the Red and Black host Amherst on Saturday at 12 p.m. and Conn College the following Tuesday. The matchup against Amherst is senior day and will be an important one. These final conference matchup will determine if the Cardinals can earn a seed as a high as four or as low as eight.